Gulets are more suitable for cruising by motor and rarely set sail. Cruising time is usually limited to 3 or 4 hours per day except on from the Fethiye Gulf to Ekincik Bay on the Marmaris route and between Gemiler Bay and Kalkan on the Kekova route. Cruising on our itineraries is close to shore and most stops are in beautiful bays and coves so the ride is almost always smooth. The waves very rarely cause discomfort. There is no reported case of shark attack in the history of the country so you can sure that your swim will be a safe one. 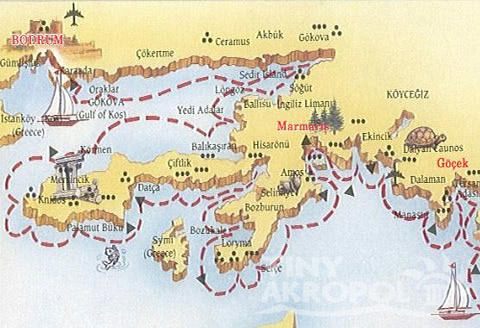 Overnight at TINY AKROPOL TRAVEL boats anchor in scenic bays close to the shore and occasionally harbour towns. During a cruise you'll have plenty of time to swim in the turquoise waters to go shore by dinghy and tour ruins or stretch your legs in spectacular nature sports or if you're feeling energetic plenty of water sports activities will sharpen your appetite for dinner. 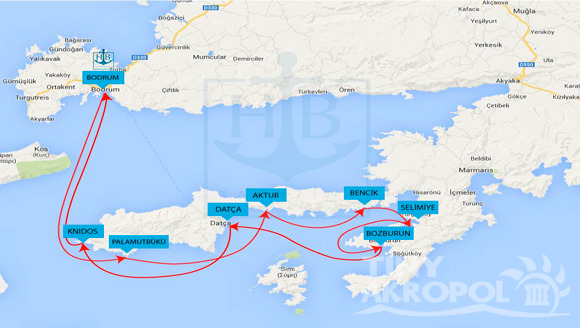 As with everything on a gulet cruise itineraries are designed to be fairly flexible. While the captain who knows all the secrets of the coastline follows a general route he is always happy where possible to accommodate the special wish of the passengers. Due to unforeseen circumstances weather conditions or the safety of his passengers/boat, itineraries may be changed by the captain.